(Nanowerk News) The research on direct exfoliation of graphite into graphene in liquids started last year at Grafen Co., now revealed first results with help from Bioorganic Chemistry and Petrochemistry of National Academy of Sciences (BPCI) of Ukraine. 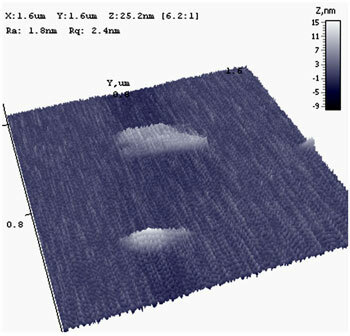 Graphene sheets synthesized by liquid-phase exfoliation. Graphene production is done by wide ranging methods from graphite oxide route to chemical vapor deposition however recently direct liquid-phase exfoliation of graphite into graphene has gained much attention by its unique product crystallinity and lower environmental footprint. Grafen Co. last year entered a study to assess the process with a large team of leading researchers from global institutions. The research project aiming to develop theoretical understanding for improved graphene production has started to give its first results. Thickness and diameter profiles of graphene sheets. Ibrahim Mutlay, Chief Science Officer of Grafen Co. has partnered with Sergiy Rogalsky and Evgeny Sheludko of BPCI, Ukraine to characterize the morphology of graphene samples synthesized by a novel liquid-phase exfoliation process developed by Grafen Co. The work was conducted at the labs of Grafen Co. and atomic force microscopy (AFM) facilities of BPCI. Initial AFM data shows multilayered graphene sheets, 10-15 nm in thickness and ∼0.5 µm in diameter proving great potential of the process.